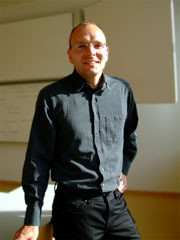 Daniel Cermak-Sassenrath is Associate Professor at the ITU, Copenhagen, and member of the Center for Computer Games Research and the Pervasive Interaction Technology Lab (PitLab). Daniel writes, composes, codes, builds, performs and plays. He is interested in artistic, analytic, explorative, critical and subversive approaches to and practices of play. He runs the University's monthly workshop series which is about electronics, mechanics, alchemy, interface devices and dangerous things. In his own practice, he makes interactive works which are shown at art exhibitions, academic conferences and popular events. He is author of a monograph about play as a perspective in everyday computer use (transcript, 2010), and editor of a volume on the playful disruption of digital media (Springer, 2018). Theories of play, critical play, play and learning, play and art, play and materiality, game design, phenomenology, transmedia. Daniel Cermak-Sassenrath, Laura Beloff, Julian Priest, Walter Langelaar, Stephen Gray. The Dark Side of Making - Reflecting on Promises, Practices and Problems of the Last 25 Years. Article. In: Proceedings of the 24th International Symposium on Electronic Art (ISEA) 2018: Intersections. Durban, South Africa, 2018, p. 414-7. Daniel Cermak-Sassenrath, Stina Hasse. Re-Volution Sampler - A Participatory Archive of Revolutionary Songs. Abstract. In: The 24th International Symposium on Electronic Art (ISEA) 2018: Intersections Wrap-Up. Durban, South Africa, 2018, p. 59. Daniel Cermak-Sassenrath. Gaming the system: Practices against the algorithmic makeover of everyday life. Article. In: Proceedings of Politics of the Machines - Art and After EVA Conference 2018, Copenhagen, DK, May 15-7, 2018. BCS Learning and Development, 2018. Daniel Cermak-Sassenrath (Ed.). Playful Disruption of Digital Media. Gaming Media and Social Effects series. Singapore, SG, Springer, 2018. Daniel Cermak-Sassenrath. Playing on the edge. Chapter. In: Daniel Cermak-Sassenrath (Ed.). Playful Disruption of Digital Media. Gaming Media and Social Effects series. Singapore, SG, Springer, 2018, p. 269-97. Daniel Cermak-Sassenrath. Makin' Cake - Provocation, self-confrontation and the opacity of play. Chapter. In: Daniel Cermak-Sassenrath (Ed.). Playful Disruption of Digital Media. Gaming Media and Social Effects series. Singapore, SG, Springer, 2018, p. 223-56. Susanne Grabowski, Daniel Cermak-Sassenrath. The potential of the contradictory in digital media - The example of the political art game PoliShot. Chapter. In: Daniel Cermak-Sassenrath (Ed.). Playful Disruption of Digital Media. Gaming Media and Social Effects series. Singapore, SG, Springer, 2018, p. 47-64. Daniel Cermak-Sassenrath. On political activism in digital games. Article. In: MedieKultur: Journal of Media and Communication Research. Vol 34, No 64 (2018): Media-ludic approaches: Critical reflections on games and research practice, p. 87-115. Daniel Cermak-Sassenrath. From material construction to cognitive construction - On the roles of the artefact in the learning process. In: Anne Hørsted, Paul Bartholomew, John Branch, Claus Nygaard (Eds.). New Innovations in Teaching and Learning in Higher Education. The Learning in Higher Education (LIHE) Series. Faringdon, UK, Libri Publishing, 2017, p. 355-75. Daniel Cermak-Sassenrath. On the playful use of digital media. In: Goethe-Institut, Brasil. Games of the South, 2016. Daniel Cermak-Sassenrath, Ayaka Okutsu, Stina Hasse. Electromagnetic Landscape - In-between signal, noise and environment. In: ISEA 2015: Disruption Proceedings. Daniel Cermak-Sassenrath, Christoffer Holmgård. Russian Reset. In: HyperKult XXV: Shutdown Workshop-Reader, 2015, p. 25-6. Daniel Cermak-Sassenrath. Playful computer interaction. Chapter. In: Valerie Frissen, Sybille Lammes, Michiel de Lange, Jos de Mul, Joost Raessens (Eds.). Playful Identities. The Ludification of Digital Media Cultures. Amsterdam, NL, Amsterdam Univ. Pr., 2015, p. 93-110. Daniel Cermak-Sassenrath, Emilie Mølllenbach. Teaching to tinker - Making as an educational strategy. Workshop description. In: Proceedings of NordiCHI 2014: Fun, Fast, Foundational. New York: ACM, 2014, p. 789-92. Daniel Cermak-Sassenrath, Clinton Watkins, Ben Kenobi. Media filter access. In: Proceedings of The 9th Australasian Conference on Interactive Entertainment (IE 2013): Matters of Life and Death, Melbourne, Australia. New York, ACM, 2013, article 35. Daniel Cermak-Sassenrath. Makin' cake and the meaning in games. In: Lin-Lin Chen, Tom Djajadiningrat, Loe Feijs, Simon Fraser, Jun Hu, Steven Kyffin, Dagmar Steffen (Eds.). Design and semantics of form and movement (DeSForM) 2013, p. 199-203. Daniel Cermak-Sassenrath, Clinton Watkins. Filtering the W*. In: Ellen Yi-Luen Do, Steven Dow, Jack Ox, Steve Smith, Kazushi Nishimoto, Chek Tien Tan (Eds.). Proceedings of the 9th ACM Conference on Creativity & Cognition 2013, Sydney, Australia. New York: ACM, 2013, p. 380-1. Jenna Gavin, Matthew Martin, Daniel Cermak-Sassenrath. Shadow Showdown. In: Ellen Yi-Luen Do, Steven Dow, Jack Ox, Steve Smith, Kazushi Nishimoto, Chek Tien Tan (Eds.). Proceedings of the 9th ACM Conference on Creativity & Cognition 2013, Sydney, Australia. New York: ACM, 2013, p. 376-7. Daniel Cermak-Sassenrath, Jenna Gavin, Matthew Martin. Makin' f*Â¢&|# cake: The innocent, the vulgar, and the scary. In: Ellen Yi-Luen Do, Steven Dow, Jack Ox, Steve Smith, Kazushi Nishimoto, Chek Tien Tan (Eds.). Proceedings of the 9th ACM Conference on Creativity & Cognition 2013, Sydney, Australia. New York: ACM, 2013, p. 374-5. Daniel Cermak-Sassenrath. Designing Games with Patterns. In: Colab Journal: Creative Technologies. Vol. 3, special issue on interactivity, 2012. Daniel Cermak-Sassenrath, Charles Walker. S(t)imulating interdisciplinarity. In: Claus Nygaard, Nigel Courtney, Elyssebeth Leigh (Eds.). Simulations, Games and Role Play in University Education. The Learning in Higher Education (LIHE) Series. Faringdon, Libri Publishing, 2012, p. 139-49. Daniel Cermak-Sassenrath. New Zealand. In: Mark Wolf (Ed.). Encyclopedia of Video Games: The Culture, Technology, and Art of Gaming. Santa Barbara: ABC-CLIO. Vol. 2, 2012, p. 440-4. Daniel Cermak-Sassenrath. Joysticks. In: Mark Wolf (Ed.). Encyclopedia of Video Games: The Culture, Technology, and Art of Gaming. Santa Barbara: ABC-CLIO. Vol. 1, 2012, p. 342-6. Daniel Cermak-Sassenrath. Box Me Dumb Human. In: Daniel Cermak-Sassenrath, Charles Walker, Chek Tien Tan, Yusuf Pisan (Eds.). Proceedings of The 8th Australasian Conference on Interactive Entertainment. Auckland, NZ, July 21-22, 2012, p. 174-5. Daniel Cermak-Sassenrath. Beyond Arcade Machines - Students Building Interactive Tangible Installations. In: Daniel Cermak-Sassenrath, Charles Walker, Chek Tien Tan, Yusuf Pisan (Eds.). Proceedings of The 8th Australasian Conference on Interactive Entertainment. Auckland, NZ, July 21-22, 2012, p. 147-55. Daniel Cermak-Sassenrath. Experiences with Design Patterns for Oldschool Action Games. In: Daniel Cermak-Sassenrath, Charles Walker, Chek Tien Tan, Yusuf Pisan (Eds.). Proceedings of The 8th Australasian Conference on Interactive Entertainment. Auckland, NZ, July 21-22, 2012, p. 129-37. Daniel Cermak-Sassenrath. Four installations inviting playful interaction. In: Edgar Rodríguez Ramírez (Ed.). Conference proceedings DeSForM 2012: MEANING.MATTER.MAKING. Design and semantics of form and movement. Wellington, NZ, April 18-20, 2012, p. 42-5. Daniel Cermak-Sassenrath. A Design Pattern Language for Oldschool Action Games. In: Nagib Callaos, Belkis Sánchez, Michael J. Savoie, Mohammad Siddique, Andrés Tremante, C. Dale Zinn (Eds.). Proceedings of The 2nd International Conference on DESIGN AND MODELING IN SCIENCE, EDUCATION, AND TECHNOLOGY: DeMset 2012. Orlando, US, March 25-28, 2012, p. 194-9. Daniel Cermak-Sassenrath. The Logic of Play in Everyday Human-Computer Interaction. In: Stephan Günzel, Michael Liebe, Dieter Mersch (Eds.). Logic and Structure of the Computer Game. Potsdam, Potsdam University Press, 2010, p. 80-103. Daniel Cermak-Sassenrath, Charles Walker. Proposal for an Installation of Four Games. Short paper, Interactive Entertainment 2010, Wellington, NZ, November 22-23, 2010. Susanne Grabowski, Daniel Cermak-Sassenrath, Niruba Balasingham, Dörte Brockmann, Patrick Einatz, Robert Hermann, Sebastian Janoschek, Isabel Micheel, Marcel Naumann, Josef Rissling, Max Roll, Timo Steinkamp, Carolin Tonn (Eds.). CoMa - Computer und Malen (Computers and Painting). Project Report, University of Bremen, 2010. Bernard Robben, Daniel Cermak-Sassenrath. Situiertes Lernen in Mixed Reality Lernräumen (Situated Learning in Mixed Reality Learning Spaces). In: lernen und lehren, 1/2010, Vol. 25, No. 97, p. 13-8. Daniel Cermak-Sassenrath. Interaktivität als Spiel - Neue Perspektiven auf den Alltag mit dem Computer (Interactivity as Play - New Perspectives in Everyday Computing). Bielefeld, transcript, 2010; Ph.D. Diss., University of Bremen, 2010. Daniel Cermak-Sassenrath, Jobst Prinzhorn. Experimente in be-greifbarem Sound (Experiments in Tangible Sound). In: Saskia Kain, Doreen Struve, Hartmut Wandke (Eds.). Workshop-Proceedings Mensch & Computer 2009, Berlin, September 6-9, 2009, Berlin, Logos, 2009, p. 155-8. Susanne Grabowski, Daniel Cermak-Sassenrath. Unvollendet - und zwar aus Prinzip! Be-greifbare Interaktion im Raum der Kunst (Unfinished Action - Tangible Interfaces and Interactive Art). In: Saskia Kain, Doreen Struve, Hartmut Wandke (Eds.). Workshop-Proceedings Mensch & Computer 2009, Berlin, September 6-9, 2009, Berlin, Logos, 2009, p. 365-8. Daniel Cermak-Sassenrath. Photo Shooting - Too Much Reality in Mixed Reality? In: Ulrike Lucke, Martin Christof Kindsmüller, Stefan Fischer, Michael Herczeg, Silke Seehausen (Eds.). Workshop Proceedings Mensch & Computer 2008, DeLFI 2008 and Cognitive Design 2008, Lübeck, September 7-10, 2008, Berlin, Logos, 2008, p. 37-8. Daniel Cermak-Sassenrath. MR Auto Racing - Mixed Reality Game for Public Installation. In: Reiner Koschke, Otthein Herzog, Karl-Heinz Rödiger, Marc Ronthaler (Eds.). Lecture Notes in Informatics (LNI) - Proceedings. Beiträge der 37. Jahrestagung der Gesellschaft für Informatik e. V. (GI). Vol. 1. Bremen, September 24-7, 2007. Gesellschaft für Informatik, Bonn, 2007, p. 570-4. Please contact me for info on publications prior to 2007. Laura Beloff, Sisse Finken, Daniel Cermak-Sassenrath. Insect Hotels/Observatories. BreakIT workshop session. ITU, Copenhagen, DK, Mar 21, 2019. Daniel Cermak-Sassenrath, Torill Mortensen. The Viking Game. BreakIT workshop session. ITU, Copenhagen, DK, Oct 4, 2018. Morten Nobel-Jørgensen, Daniel Cermak-Sassenrath. Amiga Retro Gaming. BreakIT workshop session. ITU, Copenhagen, DK, Sep 26, 2018. Daniel Cermak-Sassenrath, Laura Beloff, Julian Priest, Walter Langelaar, Stephen Gray. The Dark Side of Making - Reflecting on Promises, Practices and Problems of the Last 25 Years. Panel. 24th International Symposium on Electronic Art (ISEA) 2018, Durban, ZA, Jun 23-30, 2018. Daniel Cermak-Sassenrath, Stina Hasse. Re-Volution Sampler - A Participatory Archive of Revolutionary Songs. Artist talk and installation. 24th International Symposium on Electronic Art (ISEA) 2018, Durban, ZA, Jun 23-30, 2018. Daniel Cermak-Sassenrath, Morten Nobel-Jørgensen. Hacking PC Drives for Writing Amiga Disk Images. BreakIT workshop session. ITU, Copenhagen, DK, May 17, 2018. Daniel Cermak-Sassenrath. Playful Practices for Living with Algorithms. Talk. Politics of the Machines - Art and After conference. Copenhagen, DK, May 15-17, 2018. Daniel Cermak-Sassenrath. Those Algorithmic Lives of Ours. Installation. Politics of the Machines - Art and After conference. Copenhagen, DK, May 15-17, 2018. Sebastian Büttrich, Daniel Cermak-Sassenrath. Hacking WiFi Locks. BreakIT Extra workshop session. ITU, Copenhagen, DK, Mar 15, 2018. Daniel Cermak-Sassenrath, Sebastian Büttrich. Winding Wonder Pickups. BreakIT workshop session. ITU, Copenhagen, DK, Dec 7, 2017. Daniel Cermak-Sassenrath. Panel member. How should video games be exhibited? Game Studies Seminar, Center for Computer Games Research, ITU, Copenhagen, DK, Nov 24, 2017. Sebastian Büttrich, Daniel Cermak-Sassenrath, Rosemary Lee. Arduino Workshop. BreakIT workshop session. ITU, Copenhagen, DK, Nov 1, 2017. Daniel Cermak-Sassenrath, Max Alexander Wrighton, Hans-Joachim Backe. Hit Parade. Installation. Kulturnatten 2017, ITU, Copenhagen, DK, Oct 13, 2017. Sebastian Büttrich, Ben Cahill, Daniel Cermak-Sassenrath. Preparing Culture Night Exhibits. BreakIT workshop session. ITU, Copenhagen, DK, Oct 5, 2017. Daniel Cermak-Sassenrath. How to Fake It: Mock Ups, Prototypes and Demos. Workshop. NASA Space Apps Challenge 2017. ITU, Copenhagen, DK, Apr 28, 2017. Daniel Cermak-Sassenrath. Meet Watts in the World of Virtual Energy. Workshop host, ITU, Copenhagen, DK, April 25, 2017. Daniel Cermak-Sassenrath, Nanna Holdgaard. Museum Projection Displays. BreakIT workshop session. ITU, Copenhagen, DK, Apr 6, 2017. Daniel Cermak-Sassenrath. ITU & Universal Robots meet for innovation. Mentor, ITU, Copenhagen, DK, March 17-20, 2017. Sebastian Büttrich, Ben Cahill, Daniel Cermak-Sassenrath. Pickup Winding. BreakIT workshop session. ITU, Copenhagen, DK, Mar 2, 2017. Sebastian Büttrich, Daniel Cermak-Sassenrath. Winding Guitar Pickups. BreakIT workshop session. ITU, Copenhagen, DK, Nov 10, 2016. Daniel Cermak-Sassenrath. Flying Things. Installation. Kulturnatten 2016, Danish Science Ministry, Copenhagen, DK, Oct 14, 2016. Daniel Cermak-Sassenrath, Max Alexander Wrighton, Hans-Joachim Backe. Hit Parade. Installation. Kulturnatten 2016, Danish Science Ministry, Copenhagen, DK, Oct 14, 2016. Sara Tarby, Daniel Cermak-Sassenrath. Screamy Bird. Digital game. Kulturnatten 2016, Danish Science Ministry, Copenhagen, DK, Oct 14, 2016. Daniel Cermak-Sassenrath, Max Alexander Wrighton, Hans-Joachim Backe. Hit Parade. Installation. Demo Night, ITU, Copenhagen, DK, Oct 5, 2016. Daniel Cermak-Sassenrath, Martin Pichlmair. Alt Ctrl Game Jam 2016 Pre-Meet and Workshop. BreakIT workshop session. ITU, Copenhagen, DK, Sep 15 and 22, 2016. Daniel Cermak-Sassenrath. Lego workshop. Coach. ITU, Copenhagen, DK, May 27-29, 2016. Daniel Cermak-Sassenrath. Slotcars - Race Day. BreakIT workshop session. ITU, Copenhagen, DK, May 6, 2016. Daniel Cermak-Sassenrath. How to Fake It: Mock Ups, Prototypes and Demos. Workshop. NASA Space Apps Challenge 2016. Copenhagen, DK, Apr 22, 2016. Cameline Bolbroe, Sebastian Büttrich and Daniel Cermak-Sassenrath. Building Audio/Guitar Pedals. BreakIT workshop session. ITU, Copenhagen, DK, Apr 7, 2016. Erich Berger, Simon Gjerløv-Christensen, Daniel Cermak-Sassenrath. Etching PCB Boards. BreakIT workshop session. ITU, Copenhagen, DK, Mar 4, 2016. Stefanos Monastiridis, Daniel Cermak-Sassenrath. Design a Physical Sound Game. Workshop. CPH Music Maker Space Blågården, Copenhagen, DK, Mar 3, 2016. Daniel Cermak-Sassenrath, Hugo Mulder. 3D Printing Headphones. BreakIT workshop session. ITU, Copenhagen, DK, Dec 3, 2015. Daniel Cermak-Sassenrath. Building Slot Cars - Roll Out. BreakIT workshop session. ITU, Copenhagen, DK, Nov 5, 2015. Daniel Cermak-Sassenrath, Rodrigo Moreno Garcia, Stefanos Monastiridis. Audio Twister. Installation. Kulturnatten 2015, Copenhagen, DK, Oct 9, 2015. Anne Clausen, Daniel Cermak-Sassenrath, Martin Pichlmair. Building Crazy Controllers for Alt Ctrl Game Jam 2015. BreakIT workshop session. ITU, Copenhagen, DK, Sep 11 and 18, 2015. Daniel Cermak-Sassenrath, Ayaka Okutsu, Stina Hasse. Electromagnetic Landscape - In-between Signal, Noise and Environment. Installation and artist talk. 21th International Symposium on Electronic Art (ISEA) 2015, Vancouver, CAN, Aug 14-18, 2015. Daniel Cermak-Sassenrath, Christoffer Holmgård. Russian Reset. Installation. HyperKult XXV: Shutdown, Lüneburg, FRG, Jul 9-11, 2015. Daniel Cermak-Sassenrath, Martin Pichlmair. Building Arcade Joysticks. BreakIT workshop session. ITU, Copenhagen, DK, Jun 4, 2015. Daniel Cermak-Sassenrath. Introduction to Physical Computing. BreakIT workshop session. ITU, Copenhagen, DK, May 7, 2015. Daniel Cermak-Sassenrath, Rodrigo Moreno Garcia, Stefanos Monastiridis. Audio Twister. Installation. P-Hack Copenhagen 2015, Copenhagen, DK, Apr 24, 2015. Daniel Cermak-Sassenrath. Hacking a Parking Meter. BreakIT workshop session. ITU, Copenhagen, DK, Apr 9, 2015. Daniel Cermak-Sassenrath. Making as an Educational Strategy. Talk, Makers Day 2015, Main Library of Copenhagen, Copenhagen, Mar 20, 2015. Daniel Cermak-Sassenrath. Hacking the City's Parking Meters. BreakIT workshop session. ITU, Copenhagen, DK, Mar 12, 2015. Daniel Cermak-Sassenrath. The Intrinsic Playful Quality of the Design Process. Talk, course Auditive Culture 2: Sound Design, Kï¿½benhavns Universitet, Copenhagen, Feb 24, 2015. Daniel Cermak-Sassenrath. Field trip to Santa's workshop. BreakIT workshop session. ITU, Copenhagen, DK, Dec 4, 2014. Daniel Cermak-Sassenrath, Clinton Watkins. Not Available in Your Country. Installation. 20th International Symposium on Electronic Art (ISEA) 2014, Dubai, UAE, Oct 30-Nov 8, 2014. Daniel Cermak-Sassenrath, Clinton Watkins. filter *.com. Installation. 20th International Symposium on Electronic Art (ISEA) 2014, Dubai, UAE, Oct 30-Nov 8, 2014. Josh Berson, Daniel Cermak-Sassenrath, Jacob Ringbo. Happy Go Lucky. Installation. 20th International Symposium on Electronic Art (ISEA) 2014, Dubai, UAE, Oct 30-Nov 8, 2014. Ayaka Okutsu, Daniel Cermak-Sassenrath, Stina Hasse. EL-O. Performance. Wundergrund Festival. Copenhagen, Oct 24-Nov 1, 2014. Daniel Cermak-Sassenrath. Building Pong. Workshop. The Swedish Faculty for Design Research and Research Education. 32nd Internat: Design Games and BreakIT workshop session. Danish Design School and ITU, Copenhagen, Oct 2, 2014. Daniel Cermak-Sassenrath. Digital Beach. Installation. Digital Interactive Art Space (DIAS). Copenhagen, Sep 25-Oct 26, 2014. Daniel Cermak-Sassenrath, Ayaka Okutsu, Stina Hasse. EL-O. Installation. Digital Interactive Art Space (DIAS). Copenhagen, Sep 25-Oct 26, 2014. Ayaka Okutsu, Daniel Cermak-Sassenrath, Stina Hasse. EL-O. Performance. Digital Interactive Art Space (DIAS). Copenhagen, Sep 25, 2014. Ayaka Okutsu, Daniel Cermak-Sassenrath, Stina Hasse. EL-O. Performance. Hitparaden 2 - International Festival for Performance Kunst. Copenhagen, September 18-21, 2014. Stina Hasse, Daniel Cermak-Sassenrath, Ayaka Okutsu. Radio Art and Network Theory Remix. One-day workshop. Lunds universitet, SE, Sep 12, 2014. Daniel Cermak-Sassenrath, Emilie Møllenbach, Cameline Bolbroe. Flying things on strings. BreakIT workshop session. ITU, Copenhagen, DK, Jun 13, 2014. Daniel Cermak-Sassenrath. Playing, Making, Learning. Talk, IxD Lab, ITU, DK, Apr 24, 2014. Daniel Cermak-Sassenrath. Cigar box guitars. BreakIT workshop session. ITU, Copenhagen, DK, Apr 3, 2014. Daniel Cermak-Sassenrath. Keyboard hacks. BreakIT workshop session. ITU, Copenhagen, DK, Mar 6, 2014. Daniel Cermak-Sassenrath. MetroKit - A Collaborative Construction Kit. Presented at the Erfinder-Workshop (inventor workshop), FabLab University of Bremen, Feb 28-Mar 1, 2014. Daniel Cermak-Sassenrath, Mark Amerika. Jeu de Code. Installation. Shown at Frieder Nake. Licht ins Dunkel. 25x50 Jahre Computerkunst. Galerie der HfK, Bremen, Dec 15-28, 2013. Charles Walker, Daniel Cermak-Sassenrath. Playing on the Thresholds of Disciplines. Talk. Emergent Learning and Threshold Concepts (ELTC) 2013 conference, Hamilton, NZ, Nov 18-19, 2013. Daniel Cermak-Sassenrath. Playing with the World: Projects Past and Present. Talk, PitLab, ITU, DK, Nov 13, 2013. Daniel Cermak-Sassenrath, Jenna Gavin, Matthew Martin. Makin' Cake. Installation. Design and semantics of form and movement (DeSForM) 2013, Wuxi, China, Sep 22-5, 2013. Daniel Cermak-Sassenrath, Clinton Watkins. Filtering the W*. Installation. Creativity&Cognition (C&C) 2013, Sydney, Australia, Jun 17-20, 2013. Daniel Cermak-Sassenrath. NASA Challenge 2013. Mentor, Auckland, NZ, April 20-1, 2013. Daniel Cermak-Sassenrath. DOC NZ Lab: Transmedia. Invited panelist, Auckland, NZ, July 13-15, 2012. Daniel Cermak-Sassenrath, Susanne Grabowski, Jörn Ketelsen. PoliShot - Interactive Installation and DADA Game. Installation, Städtische Galerie, Bergkamen, Germany, April 1-July 1, 2011. Daniel Cermak-Sassenrath. DOC NZ Lab: Transmedia. Invited panelist, Auckland, NZ, February 19-21, 2011. Kieran Berger, Jonathan Butterworth, Hanan Finnerty, Bryan Lee, Daniel Cermak-Sassenrath, Charles Walker. Custom Light Cycles, Tank Warz, C.A.R.S. Installations, Interactive Entertainment 2010, Wellington, NZ, November 22-23, 2010. Daniel Cermak-Sassenrath. Playful Computer Interaction. Invited talk, Homo Ludens 2.0 Play/Media/Identity, Ütrecht, NL, November 17-18, 2010. Jonathan Butterworth, Hanan Finnerty, Daniel Cermak-Sassenrath. Custom Light Cycles, Tank Warz. Installations, Creative Tech, Auckland, NZ, September 10-11, 2010. Daniel Cermak-Sassenrath, Susanne Grabowski, Jörn Ketelsen. PoliShot - Interactive Installation and DADA Game. Installation, Computer Kunst - Goldener Plotter 2010. Gladbeck, August 29-September 26, 2010. Daniel Cermak-Sassenrath. Play, Tangible Interaction, 2D. Talk, Postgraduate & Research Guest Lecture Series, Faculty of Art & Design, Auckland University of Technology, NZ, May 26, 2010. Daniel Cermak-Sassenrath, Susanne Grabowski, Jörn Ketelsen. PoliShot - Interactive Installation and DADA Game. Installation, Weserburg. Bremen, March 18-April 4, 2010. Daniel Cermak-Sassenrath. DOC NZ Lab: Borderless Media. Invited panelist, Auckland, NZ, February 27-28, 2010. Daniel Cermak-Sassenrath. The Logic of Play in Everyday Human-Computer Interaction. Invited talk, Logic and Structure of the Computer Game-Conference, Digital Games Research Center of the University of Potsdam, November 5-7, 2009. Daniel Cermak-Sassenrath. QuoteStar. Installation, Gesamtschule Ost, Bremen, June 2009. Daniel Cermak-Sassenrath. Mixed Reality Space Race. Installation, Computer Kunst - Goldener Plotter 2008. Gladbeck, September 28-October 26, 2008. Daniel Cermak-Sassenrath. MR Photo Shooting. Installation, Theorie- und Praxiswerkstatt Be-greifbare Interaktion (Workshop on Theory and Practice of Tangible Interaction). Mensch & Computer Jahreskonferenz des Fachbereichs Mensch-Computer-Interaktion der Gesellschaft für Informatik e. V. (GI). Lübeck, September 7-10, 2008. Daniel Cermak-Sassenrath. MR Auto Racing - Mixed Reality Game. Installation, Workshop Mixed Realities und Be-greifbare Interfaces für Bildungsprozesse (Workshop on Mixed Realities and Tangible Interaction). Jahrestagung der Gesellschaft für Informatik e. V. (GI). Bremen, September 25, 2007. Daniel Cermak-Sassenrath, Martin Faust. AirKanoid. Installation, Computer Kunst - Goldener Plotter 2006. Gladbeck, September 24-October 22, 2006. Daniel Cermak-Sassenrath. Spiele im CAVE (Games for CAVEs). Talk in the series Computerspiele-Entwicklung in Bremen (Computer Game Development in Bremen), Municipal Library of Bremen, May 22, 2006. Please contact me for info on talks, workshops, performances, installations, and films prior to 2006. Daniel Cermak-Sassenrath, Erik Grönvall, Tomas Sokoler. Introduction to Programming, Course, ITU, Copenhagen, Autumn 2018. Daniel Cermak-Sassenrath, Alexander Richter, Gitte Bang Stald, Kasper Støy. Cross-Disciplinary Team Work (ITU's Interdisciplinary Project), Course, ITU, Copenhagen, Autumn 2018. Espen Aarseth, Paolo Burelli, Daniel Cermak-Sassenrath, Martin Pichlmair, Sebastian Risi, Miguel Sicart. Thesis Preparation, Course, ITU, Copenhagen, DK, Autumn 2018. Daniel Cermak-Sassenrath. Programming for Designers: Programming for Interactivity, Course, ITU, Copenhagen, Autumn 2017. Daniel Cermak-Sassenrath. Games X - An Explorative Investigation into the Fringes of Play, Individual Study Project, ITU, Copenhagen, DK, Autumn 2017. Daniel Cermak-Sassenrath, Sebastian Risi. Dynamic and Emergent Population Behaviour as a Game Design Asset, Individual Study Project, ITU, Copenhagen, DK, Autumn 2017. Daniel Cermak-Sassenrath. Programming for Game Designers: Programming as a Design Tool, Course, ITU, Copenhagen, Spring 2017. Espen Aarseth, Hans-Joachim Backe, Daniel Cermak-Sassenrath, Anders Løvlie, Morten Nobel-Jørgensen, Martin Pichlmair, Sebastian Risi, Miguel Sicart. Thesis Preparation, Course, ITU, Copenhagen, DK, Autumn 2017. Daniel Cermak-Sassenrath, Erich Berger. Experimental Interaction: Material Game Interfaces, Course, ITU, Copenhagen, DK, Autumn 2016. Daniel Cermak-Sassenrath, Louise Petersen Matjeka. Play Design, Course, ITU, Copenhagen, DK, Autumn 2016. Daniel Cermak-Sassenrath, Louise Petersen Matjeka. Designing Digital Play, Course, ITU, Copenhagen, DK, Autumn 2016. Hans-Joachim Backe, Daniel Cermak-Sassenrath, Morten Nobel-Jørgensen, Martin Pichlmair, Sebastian Risi, Miguel Sicart. Thesis Preparation, Course, ITU, Copenhagen, DK, Autumn 2016. Daniel Cermak-Sassenrath. Programming for Game Designers: Interaction for the People, Course, ITU, Copenhagen, Spring 2016. Morten Nobel-Jørgensen, Daniel Cermak-Sassenrath. Graphics Programming, Course, ITU, Copenhagen, Spring 2016. Daniel Cermak-Sassenrath. Experimental Interaction: Blank Spots in Game Design, Course, ITU, Copenhagen, DK, Autumn 2015. Daniel Cermak-Sassenrath, Kristín Guðmundsdóttir. Designing Digital Play, Course, ITU, Copenhagen, DK, Autumn 2015. Daniel Cermak-Sassenrath, Kristín Guðmundsdóttir. Play Design, Course, ITU, Copenhagen, DK, Autumn 2015. Espen Aarseth, Daniel Cermak-Sassenrath, Sebastian Risi, Hans-Joachim Backe, Noor Shaker, Martin Pichlmair, Joel Lehman. Thesis Preparation, Course, ITU, Copenhagen, DK, Autumn 2015. Daniel Cermak-Sassenrath. Programming for Game Designers: Making the Game, Course, ITU, Copenhagen, Spring 2015. Daniel Cermak-Sassenrath. Experimental Interaction: Digital Games and Embodied Play, Course, ITU, Copenhagen, Autumn 2014. Julian Togelius, Daniel Cermak-Sassenrath. Thesis Preparation, Course, ITU, Copenhagen, Autumn 2014. Daniel Cermak-Sassenrath. Programming for Game Designers: Creating Interactive Systems, Course, ITU, Copenhagen, Spring 2014. Daniel Cermak-Sassenrath. Happy Go Lucky - A Smile and Run Game, Student Project, ITU, Copenhagen, Autumn 2013. Daniel Cermak-Sassenrath. Experimental Interaction: Games that Challenge Play, Course, ITU, Copenhagen, Autumn 2013. Daniel Cermak-Sassenrath, Henrike Lode. User Experience and Prototyping, Course, ITU, Copenhagen, Autumn 2013. Daniel Cermak-Sassenrath. Guerrilla Play Spaces, Studio Project, Auckland University of Technology, Auckland, 2013, Semester 1. Daniel Cermak-Sassenrath. Persuasive Game: Raising Malaria Awareness, Studio Project, Auckland University of Technology, Auckland, 2013, Semester 1. Daniel Cermak-Sassenrath. The Animatronic Social, Studio Project, Auckland University of Technology, Auckland, 2013, Semester 1. Daniel Cermak-Sassenrath. Simulated and Immersive Environments 1/3: Space Action Meaning, Course, Auckland University of Technology, Auckland, 2013, Semester 1. Daniel Cermak-Sassenrath. Train Zoetrope, Studio Project, Auckland University of Technology, Auckland, 2012, Semester 2. Daniel Cermak-Sassenrath. An Exploration of Story Telling Through a Game, Studio Project, Auckland University of Technology, Auckland, 2012, Semester 2. Daniel Cermak-Sassenrath. Transformation, Studio Project, Auckland University of Technology, Auckland, 2012, Semester 2. Daniel Cermak-Sassenrath. CoffeeDate Dating Service, Studio Project, Auckland University of Technology, Auckland, 2012, Semesters 1-2. Daniel Cermak-Sassenrath. Simulated and Immersive Environments 2/4: Simulation and Play, Course, Auckland University of Technology, Auckland, 2012, Semester 2. Daniel Cermak-Sassenrath. A Game of Social Play, Studio Project, Auckland University of Technology, Auckland, 2012, Semester 1. Daniel Cermak-Sassenrath. Simulated and Immersive Environments 1/3: Playing on the Edge, Course, Auckland University of Technology, Auckland, 2012, Semester 1. Daniel Cermak-Sassenrath. Simulated and Immersive Environments 2/4: A Pattern Approach to Action Game Design, Course, Auckland University of Technology, Auckland, 2011, Semester 2. Daniel Cermak-Sassenrath. The Making of a Persistent Online Game, Studio Project, Auckland University of Technology, Auckland, 2011, Semester 2. Julian Priest, Daniel Cermak-Sassenrath. Time in Media, Studio Project, Auckland University of Technology, Auckland, 2011, Semester 2. Daniel Cermak-Sassenrath. Simulated and Immersive Environments 1/3: Embodiment, Tangible Interaction and Games, Course, Auckland University of Technology, Auckland, 2011, Semester 1. Daniel Cermak-Sassenrath. Programming for Creativity: Creating Interactive Systems, Course, Auckland University of Technology, Auckland, 2011, Semester 1. Daniel Cermak-Sassenrath. Urban Farming, Studio Project, Auckland University of Technology, Auckland, 2011, Semester 1. Daniel Cermak-Sassenrath. Realism in Computer Games, Studio Project, Auckland University of Technology, Auckland, 2011, Semester 1. Daniel Cermak-Sassenrath. Simulated and Immersive Environments 4: Simulation and Play, Course, Auckland University of Technology, Auckland, 2010, Semester 2. Daniel Cermak-Sassenrath. E-Motion Game, Studio Project, Auckland University of Technology, Auckland, 2010, Semester 2. Daniel Cermak-Sassenrath. Simulated and Immersive Environments 1: Immersion and Participation, Course, Auckland University of Technology, Auckland, 2010, Semester 1. Daniel Cermak-Sassenrath, Nikki Anderton. Programming for Creativity, Course, Auckland University of Technology, Auckland, 2010, Semester 1. Daniel Cermak-Sassenrath. Faking Media, Studio Project, Auckland University of Technology, Auckland, 2010, Semester 1. Daniel Cermak-Sassenrath, Bernard Robben, Susanne Grabowski. Art in Action: Computerspiele, interaktive Kunst und neue Schnittstellen (Computer Games, Interactive Art and New Interfaces), Course, University of Bremen and University of the Arts (Hochschule für Künste), Bremen, Winter Semester 2009/10. Susanne Grabowski, Daniel Cermak-Sassenrath. Computer und Malen (Computers and Painting), Student Project, University of Bremen, Summer Semester 2009. Daniel Cermak-Sassenrath, Bernard Robben. Computer Games and Interactive Installations, Course, University of Bremen and University of the Arts (Hochschule für Künste), Bremen, Winter Semester 2008/9. Bernard Robben, Daniel Cermak-Sassenrath. Theory, Design and Evaluation of Digital Media, Seminar, University of Bremen, Winter Semester 2007/8. Bernard Robben, Daniel Cermak-Sassenrath. Theorie digitaler Medien (Digital Media Theory), Lecture with laboratory work, University of Applied Sciences, Bremen, Winter Semester 2007/8. Daniel Cermak-Sassenrath, Marc Herrlich, Martin Faust. Mixed Reality Gaming - Where the Action is (Stud.IP), Course, University of Bremen, Winter Semester 2007/8. Bernard Robben, Daniel Cermak-Sassenrath. Theorie digitaler Medien (Digital Media Theory) (moodle), Lecture with laboratory work, University of Applied Sciences, Bremen, Winter Semester 2006/7. Martin Faust, Daniel Cermak-Sassenrath, Bernard Robben. Multiplayer Game Design and Algorithms, Course, University of Bremen, Winter Semester 2006/7. Please contact me for info on teaching prior to 2005/6. Daniel Cermak-Sassenrath, Charles Walker. Conference chairs, The 8th Australasian Conference on Interactive Entertainment (IE) 2012: Playing the System, Auckland, NZ, July 21-22, 2012. Daniel Cermak-Sassenrath, Emilie Mølllenbach. Teaching to Tinker - Making as an Educational Strategy. One-day workshop. NordiCHI 2014: Fun, Fast, Foundational, Helsinki, FIN, October 26-30, 2014. Committee member, Mobile Innovation Network Australasia (MINA) 2018. Melbourne, AUS and Wellington, NZ, November 16, 2018. Program committee member, 24th International Symposium on Electronic Art (ISEA) 2018: Intersections. Durban, ZA, June 23-30, 2018. Program committee member, Designing Interactive Systems (DIS) 2018: Diversity and Design. Hong Kong, HK, June 9-13, 2018. Program committee member, Second International Conference on Human Computer Interaction Theory and Applications (HUCAPP) 2018, Funchal, PRT, January 27-9, 2018. Program committee member, Digital Games Research Association (DiGRA) Conference 2017, Melbourne, AUS, July 3-6, 2017. Committee member (technology demonstrations), ACM Creativity & Cognition (C&C) 2017 Conference, Singapore, SG, June 27-30, 2017. Program committee member, 23rd International Symposium on Electronic Art (ISEA) 2017: Bio-Creation and Peace. Manizales, COL, June 12-18, 2017. Program committee member, International Conference on Human Computer Interaction Theory and Applications (HUCAPP) 2017, Porto, PRT, February 27-March 1, 2017. Committee member, The 13th Australasian Conference on Interactive Entertainment, IE 2017: "Growing Interactivity" - Techniques & Opportunities for Interactive Play. Victoria, AUS, Jan 31-Feb 3, 2017. Committee member, Mobile Innovation Network Australasia (MINA) 2016: Mobile Futures: Poetics, Production and Innovation. Melbourne, AUS, Nov 30-Dec 1, 2016. Committee member, NordiCHI 2016: Game-Changing Design. Gothenburg, SE, October 23-27, 2016. Committee member, Digital Games Research Association (DiGRA)/Foundations of Digital Games (FDG) Conference 2016. Dundee, UK, August 1-6, 2016. Daniel Cermak-Sassenrath. Robots and Artificial Life - Student Projects Showcase Event. Reviewer. ITU, Copenhagen, DK, Jun 2, 2016. Committee member, 22nd International Symposium on Electronic Art (ISEA) 2016: Cultural R>evolution. Hong Kong, CHN, May 16-22, 2016. Reviewer, CHI 2016 - #chi4good, Student Game Competition. San Jose, US, May 7-12, 2016. Reviewer, The Journal of Creative Technologies (JCT). Creative Gaming special issue, 2016. Committee member, Mobile Innovation Network Aotearoa (MINA) 2015: In Perspective. Melbourne, AUS, Nov 18, 2015. Committee member, Foundations of Digital Games (FDG) 2015. Pacific Grove, US, June 22-25, 2015. Committee member (posters and demonstrations), Creativity & Cognition (C&C) 2015. Glasgow, UK, June 22-25, 2015. Committee member, The 8th International Conference on Game and Entertainment Technologies (GET) 2015. Las Palmas de Gran Canaria, ES, July 22-24, 2015. Reviewer, CHI 2015 - Crossings, Work-in-Progress and Student Game Competition. Seoul, KR, April 18-23, 2015. Committee member, Mobile Innovation Network Aotearoa (MINA) 2014, Symposium & Screening. Wellington, NZ, Nov 2014. Reviewer, CHI PLAY 2014, Full Papers. Toronto, CAN, Apr 26-May 1, 2014. Reviewer, CHI 2014 - One of a CHInd. Student Game Competition, Toronto, CAN, Apr 26-May 1, 2014. Reviewer, The International Conference on Managing the Asian Century (ICMAC) 2013. JCU, Singapore, SG, Jul 11-13, 2013. Committee member, The International Mobile Creativity and Mobile Innovation Symposium - Mobile Innovation Network Aotearoa (MINA). Wellington, NZ, November 23-25, 2012. Reviewer, The Portuguese Foundation for Science and Technology (Fundação para a Ciência e a Tecnologia, FCT), 2012. Reviewer, Colab Journal: Creative Technologies, special issue on interactivity, 2012. Program co-chair, The 8th Australasian Conference on Interactive Entertainment, IE 2012: Playing the System. Auckland, NZ, July 21-22, 2012. Reviewer, Tangible, Embedded and Embodied Interaction (ACM TEI) Conference. Cambridge, US, January 25-27, 2010. Founding member, Be-greifbare Interaktion in gemischten Wirklichkeiten (Tangible Interaction in Mixed Reality) research group, Gesellschaft für Informatik e. V. (GI), 2008-2012. Here are some little tools, screen savers and games. All of these are freeware and full versions. Most require Windows. Have fun! The City Clock shows the local time along with the local time in Los Angeles, New York, London, Berlin, and Tokyo. An additional analog clock always shows the local time and can be toggled on and off. The Starflight screen saver takes you on a trip through an unknown universe filled with a myriad of stars. The Snowfall screen saver lets winter take over. Falling snowflakes slowly cover the entire desktop,and transform it into a smooth and silent white landscape. The Blue screen saver colors the desktop in solid blue, orange, pink, brown, or whatever custom color one chooses. It is a screen saver that actually saves the screen, nothing more, nothing less. Fractals zooms in on fractals randomly generated from the Julia set. Nurtle is a nerdy Turtle Graphics implementation in Processing. It is intended to be used to experiment with (graphical) recursion. Feel free to modify. Ten artillery stations sit on a hilly mountain range and shoot at each other. Each station can turn its cannon and change its shooting power. Up to ten human players can take part, the rest is filled up with AI computer players. The game is in real time, i.e. all stations can calculate, aim and shoot all the time, there are no rounds. Played with joysticks, joypads or keyboard.